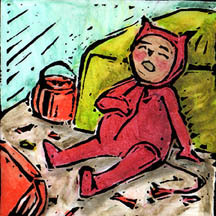 Humblearts Journal: Illustration Friday - Trick or Treat! Ahhhh... the aftermath. This is fantastically done. OMG! That's me, except I don't usually wear a costume to overdo the chocolate! My husband as a young boy! This is great...I love your style! oh, yes, i can relate!! what a darling little fella. i love that woodcut look of your line and your colors are just scrumptious! I feel his pain-haha! Wonderful colors, heather.